See the full list of Jitbit third-party integrations. The JIRA integration module simply allows converting helpdesk tickets into JIRA issues. If a technician decides a ticket should be logged in your bug-tracker, he can do this with a click of a button. Once you're done, you'll see the "Create JIRA issue" button in your tickets. Clicking this button brings up a dialog that prompts you to select a JIRA project and creates an issue in it, with a link to the ticket in the issue body. Once the issue has been created, the "Create JIRA issue" button disappears and a link to the JIRA issue is displayed in the ticket instead. While the newly created JIRA issue will have a link to the helpdesk ticket in the issue body. 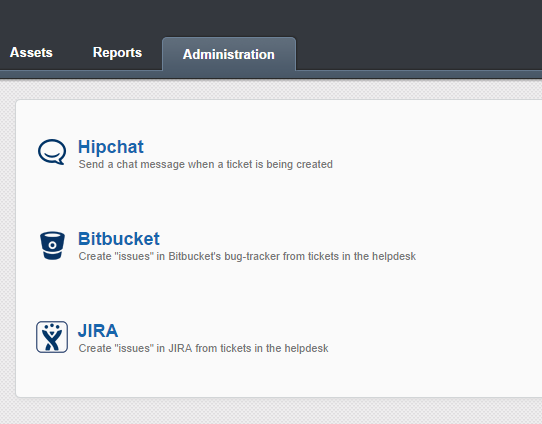 Helpdesk also supports integration with Bitbucket And GitHub, both of those also have built-in issue-trackers. Works the same way - allowing you to create issues that are linked to support tickets.